2014 marks the tenth anniversary of one of the most remarkable publishing ventures in Polish music. 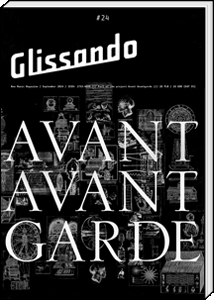 Glissando magazine has ploughed its own furrow determinedly since 2004, despite a few rocky moments around 2008. It has produced an average of two issues per year, in an A4 format, on no-nonsense matt paper and eschewing colour temptations except everything on the chart between black to white. Its design is quirky (characteristically Polish) and often reminds me of a cross between underground literature (but of a much higher print quality) and art movements of decades ago. The most recent issue (no.24) has gone glossy without losing its character. The contents are listed at the end of this post. The intent of Glissando has been clear from the start: to provide an alternative to mainstream music journalism and musicology. It has done so by stressing what is going on in the work of composers and writers in their 20s and 30s and by giving a main focus to each issue (but not to the exclusion of all else). As you can see from the banner headings given below, there was an early emphasis on music in other countries, on broader issues and concepts, and on digging into the past. This has been nuanced over the years, with certain themes recurring, notably the exploration of sound and space. The next issue (no.25, edited by Antoni Michnik) is called ‘Manifestos’ while the one after that (no.26, edited by Krzysztof B. Marciniak) returns to a familiar topic, ‘Soundscape’. Since the start of 2014, Glissando has gone for guest editors (from within and without its regular team) and this gives great scope for diversity and depth. But one must acknowledge that there have been, and still are, key figures in Glissando‘s history, among them Jan Topolski and Michał Mendyk. Topolski is still at the centre of things and, in addition, has written a wonderful study of Gérard Grisey – Widma i Czasy (Spectra and Time; Warsaw, 2012). Michał Mendyk has moved sideways to develop the independent record company, Bôlt, which has likewise pursued a distinct identity and now has a unique repertoire of archival and new recordings from Poland and elsewhere in Eastern Europe. Other important contributors to the success of Glissando include Agata Kwiecińska and Eliza Orzechowska, who were part of the team from the beginning, and others, more recently, including Jacek Plewicki and Filip Lech. The roster of writers includes notable names, of which I will mention only two here – Monica Pasiecznik and Michał Libera, partly because, like Jan Topolski writing on Grisey, they have gone on to publish major studies in the music series published by Wydawnictwo Krytyki Politycznej. There are two books by Pasiecznik – Rytuał superformuły. Stockhausen Licht (The Ritual of Superformulae. Stockhausen’s Licht; Warsaw, 2011) and Po zmierzchu. Eseje o współczesnych operach, co-authored with Tomasz Bierniacki (After Twilight. Essays on Contemporary Opera; Warsaw, 2013) – and one by Libera (who is also the guest editor of Glissando 24) – Doskonale zwyczajna rzeczywistość. Socjologia, geografia albo metafizyka muzyki (A Perfectly Ordinary Reality. The Sociology, Geography or Metaphysics of Music; Warsaw, 2013). There has been an important strategic decision made this year at Glissando, and that is to switch to English rather than stay in Polish. The primary intention is to attract contributors and readers from elsewhere in Eastern Europe rather than from ‘The West’. This focus on new music in Eastern Europe matches Bôłt’s existing strategy. The printed edition of no.23 is half-and-half Polish-English, no.24 completely in English. Both languages are represented online. The English online choice currently consists of just six articles (up from four last week): one from no.17, one from no.22, three from no.23 and one from no.24. (A glance at this last item indicates that there may be textual and illustrative differences between the printed and online versions.) The Polish online choice is much wider; it may even be comprehensive – I can’t tell (it stretches right back to no.1). The plan for future issues is to have all articles in both languages, one in print and the other online. It would be a tall task to translate all the past Polish articles into English, but one lives in hope that some of them will be singled out. The Glissando website is well worth a visit, even if it may take a while to work out how to navigate the differently constructed English and Polish sections. Long may it and its team challenge and provoke!